I walked up to JINYA Ramen Bar at 7010 Dodge for their media soft open in mid-September with an awful lot of hope in my heart. 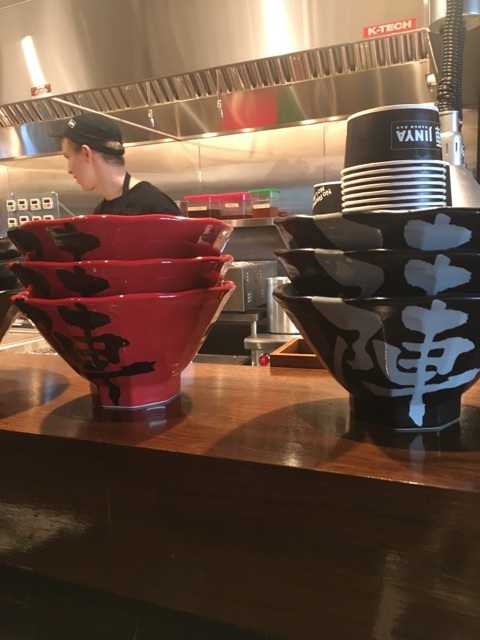 Frankly, I expected Omaha to have sprouted a dozen ramenries after the overwhelming success of Ramen Fest, and the clear talent Omaha chefs have for the pain staking process. As it stands, Omaha has few choices for a choice bowl, and I was excited to learn we would soon have one more spot to sink our sticks. The décor is a bit off-brand for the area it occupies, but the clean look of the bold lettering is a bright start. The entryway feels a touch claustrophobic, but in a familiar way that’s even a little inviting. Upon entering, you are greeted by a chorus of servers, hosts, and chefs shouting “Irassyai”, or welcome. I took my seat at the bar and had just enough time to take inventory of the layout and design of the interior. A representative informed me that the design is the traditional décor of all JINYA restaurants, and It’s pleasing without feeling at all overdone. While the restaurant was very busy, and working out opening night kinks, our server was knowledgable, patient, and unperturbed by the infinite questions the patrons fired at her, and wore a relaxed smile the entire evening. I began with a JINYA Bun and hot sake, which arrived very quickly. The pork was very fatty, which I overheard someone complain about, though it was the same texture and fattiness I’m accustomed to in a steam bun. I found the meat itself very pleasing, and while I often find steam buns over-sauced, the ratio was excellent. My only issue was the texture of the bun itself, which was somehow papery and gummy at once. If I had to wildly guess (which I kind of do) the bun was placed on a plate that was straight out of the sanitizer, which caused the bottom of the bun to cook and sit in condensation. I looked through the menu multiple times, but I knew before I opened it that I would be ordering the Tonkatsu. What I hadn’t considered was that there are about 20 optional add-ins offered. My dining companion ordered the chicken ramen with cheese and tomatoes. 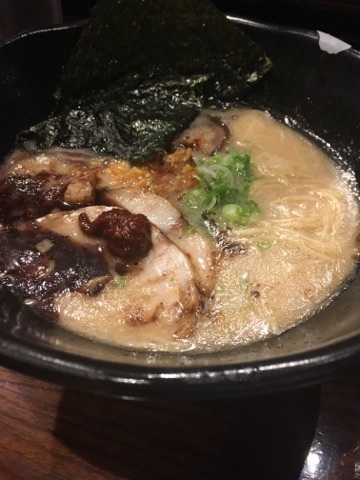 The broth was on the thin side, and the cheese and tomato altered the traditional flavors of the ramen to such a degree that it read more as Italian take. If you’re dining with someone who’s a bit hesitant to try the cuisine, it’s an excellent ramen-lite option. There are two options for Tonkatsu, Spicy or Black. I opted for the latter, which still features a moderate dose of the fiery red chili paste featured in the spicy dish, just a more modest kick. The rest of the bowl was comprised of pork chashu, kikurage, green onion, garlic oil, fried onion, and the thin noodle (there are two options) topped with 2 sheets of nori. The fact is, I have seen three types of Tonkatsu broth in Omaha. The first, a savory soup. Thin, but nice. The second, greasy water. One part chewing the fat (literally) and one part water, the two separated by the laws of chemistry. Then the third. The third was what I was served in my JINYA Tonkatsu Black. Velvety, unctuous, and rich, you can taste the time the stock was allowed to develop. Tiny pools of garlic oil suspended in the rich base make the broth a hearty meal on its own. As I slurped the last of my noodles, our attentive server casually gestured toward a sign on the counter that informed me of the option to add more of the house-made noodles to my bowl. The original serving was generous already, and while I was a bit beyond satisfied, I was in a committed relationship with the bowl of 20 hour stock, and I’m no quitter. This bowl is not for dieters, or those prone to gout. Or those who let themselves feel guilty over heavenly indulgences or cringe at the phrase “Mouth Feel”, because you’re going to hear it and against every desire in your body, you’re going to use it when describing your bowl. The dessert menu was as tempting as the main courses, and I struggled between the mochi ice cream and the popsicle, which our waitress described as “very pretty”. I still feel good about my decision to put myself into sleepy-full status with my order of the panna cotta. Cold and creamy, topped with graham cracker croutons and a mint leaf, it was a sweet end to a savory evening. Vegan options are available, and most bowls are easily customizable. A kids meal covers all the bases with a small portion of chicken ramen, chashu rice, crispy chicken, sweet potato fries, orange, candy, and vanilla ice cream. The prices seemed very reasonable upon reading the menu, but when you have the actual portion in front of you, it’s easy to feel you’re getting the better end of the deal. Use the money you’re saving to tip your staff. They’re truly top-shelf. While JINYA is a California-based chain restaurant, the noodles and broth are all made fresh daily, and through a grueling process that takes the manufactured feeling out of the establishment. What JINYA gains through being a chain is a clear understanding of who their client base is, and how to run a clean operation. If you’re a ramen purist, you will have a few issues with the execution. You’re not going to find the love you found in Sunday Night Ramen or Ugly Duck here, but you’re going to find a damn delicious bowl, and you’re going to leave satisfied.